1. 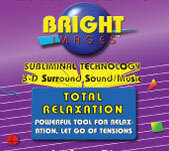 All Bright Images products are shipped by USPS, by Priory US Mail Service. 2. All products are shipped on during normal business hours, week days. We normally ship in 24 to 36 hours, following the next business day after you have placed your order in the shopping cart. 3. After your order is placed, you will receive another email indicating that your order has been shipped to you by Priory US Mail. 4. Normally, you should be receiving your product within 3-5 business days from the date of your online order. On Line Orders have proved to be the most efficient in order processing. 5. All mp3 purchases are made through our shopping cart. Once your mp3 order is placed, you will see your download links on your order receipt to complete your order. Save your download link(s) prior to using them in case you have to repeat your download or you misplace them on your computer. You can now use your link(s) to get to the download page to receive your registered copy of your mp3 program(s) to your computer, SAVED DOWNLOAD LOCATION. You now at least 24 hours to use this download link, so be sure to SAVE this link to your favorite links on your browser or on your desktop on your computer. In the rare case your first download is interrupted or you loose service, you can still repeat your download at any time during the next 24 hours. The main task you may need to remember is the location that you have saved your new download Bright Images mp3 file, as you will what to use it soon. 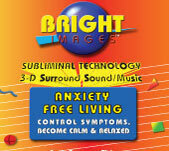 You should have a specific follow named, Download, Bright Images or perhaps Self Help Education, so that you can easily use them. 6. 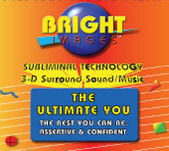 The download file size for the Bright Images mp3 programs are about 55 mb, each 60 minutes of CD audio quality programming. Depending on your download speeds, this will take a several minutes. Using a typical DSL/Cable modem speed, your download may run about 10 minutes or less to download. or 888 727-8959 and please have your order information ready. 8. Please read your QUICK START GUIDE to experience Quick Results. (2) Just get into the habit of listening to your tapes, CD's and MP3 programs as much as possible and you will begin to realize their positive effects, helping you make positive improvements in your life. A regular daily habit during your normal day of activities. 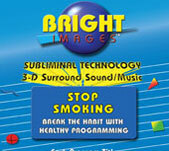 (3) You will not have to pay attention to your programs playing. 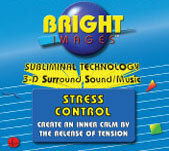 They are specifically designed to be used as background music while you are at work, home or on the go. This process works while you are doing something else at the same time during your busy day. 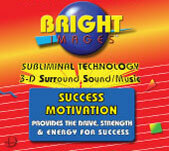 Going to work, the gym, running an errand, take your programs with you and multi-task. (4) You have just taken the first step, making a conscious decision for specific positive and healthy change in your life. Now you have the tools for them to take root. (5) The next step is to accumulate the sufficient number of hours, equal too and exceeding your previously stored “data” on these same subject areas. The task is to overpower any (negative thoughts, ideas, visions & bad habits) you may currently have stored in your mind’s data files, on the subject. Your bio-computer’s present data may be preventing you from achieving success and happiness in your life. 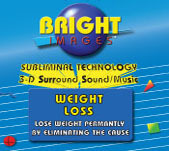 Using Bright Images Programs using highly concentrated and focused data is the key to making self improvement simple to achieved during any normal day’s events. (6) Expect people around you to first notice positive changes taking place in your life in your appearance, attitude and in your motivation. Notice small improvements in your daily habits, as you take a positive direction interacting with the people around you. You will be delighted to notice many of your old habits changing in a positive and healthy direction. As your experience a new path of inspiration to reach your personal self improvements goals, your success and happiness can then mature. (7) Today we have very portable and affordable small music players to use our self help programs anywhere and at anytime. These popular personal MP3 players now offer the most convenient methods available today for self improvement on the go. 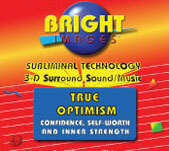 (8) Bright Images offer 37 Professional Bright Images Programs are recorded in “CD audio quality” MP3 file programs. 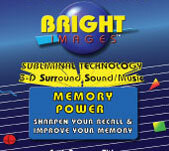 Use them in all your popular mp3 players, which are all available from Bright Images web site. (9) Remember to just PUSH PLAY and set up for player to auto-repeat, continuous play mode for all day and all night use, if possible. (10) Visit our site often, (add as a favorite link) as we are constantly providing additional Self-Help Tools to each or our 37 Programs. 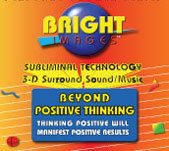 In addition, we provide Subliminal News articles and Special Deals offered each month to assist you with achieving your desired goals.